As a member of a CO-OP Board, you have responsibilities managing and maintaining the flow of communication, tracking critical decisions and proxy votes, as well as regularly performing vendor management to make sure all your building is kept in check. Procorem CO-OP software acts as a portal for your board to organize your documents, clarify communication and securely store and share sensitive information. With all your board files, compliance documents, financial documents, shareholder newsletters, vendor contracts and tenant files in a single location, you can be sure your board is staying on track. Procorem goes beyond files, with tasks, commenting, email integration and a complete audit history for shareholder votes, proxies and more. Our comprehensive collaboration tool allows Board Members to comment on documents, manage Board Member approval processes and more! Procorem CO-OP Software also provides a complete audit trail which can document and store board decisions. Procorem CO-OP software offers secure cloud storage for sensitive information. WorkCenters are invite-only, and each file is individually encrypted to ensure your data never ends up in the wrong hands. Eliminate numerous emails and misplaced documents. Procorem CO-OP Software allows you to create a library of building documents in a single platform. Take control of your data and keep an auditable history regardless if you switch property managers or rotate board memebers. 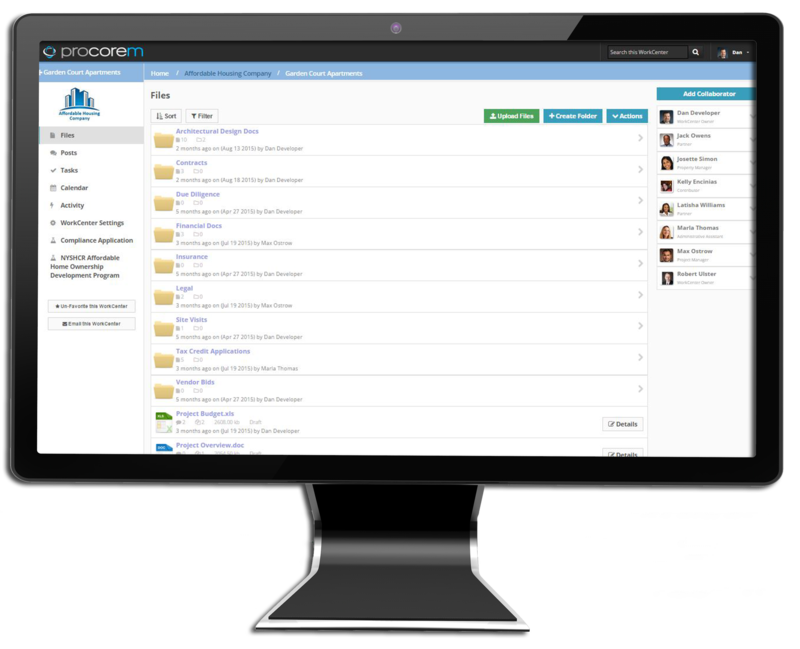 Procorem allows users to store, share and collaborate in a secure, digital space known as a WorkCenter. Everything is in one place so information is easily accessible and transferable to both internal and external parties. As a treasurer for a 280 unit building in midtown Manhattan, Procorem has allowed myself and the rest of our board to access all of our important documents in one safe and secure location. We are able to retrieve applications, contracts, and other financial documents seamlessly through both desktop and mobile devices. Instead of searching through emails, we can view comments and other communications in one centralized location. Bottom line is Procorem has made my job easier and I thoroughly recommend it! What I like about Procorem is when I begin a project that is monitored by a federal agency and we need to share a large volume of sensitive information, it only takes a few minutes to setup a new WorkCenter and invite others to participate in a secure environment. Then, once the project is complete, I can delete the WorkCenter with a few clicks of the mouse.